I have spent a lot of my life in the shadows. Not to be dramatic or anything, but really, I have. My sister and I had a hard life growing up, in many ways, and I’ve spent many years trying to overcome that. A rocky childhood left me with self-esteem-issues, with the thought that I had to be everyone’s peace-maker, and that I had to keep up a sunny facade to the outside world, no matter what I was feeling inside or going through. It was less likely that I’d walk into more trouble if I just kept back and tried to remain unnoticed. The problem with staying back, in the shadows, is that I missed out on so many good things. I said no to trips to the beach with friends, amusement park rides, big birthday trips with other women who I thought I didn’t fit in with, and I stayed at home, instead. There’s nothing wrong with home. It’s safe. What’s really bad, though, is not just that I missed out on fun times building relationships with other people, but also that I missed out on helping and giving to other people. I was staying home, being safe! I didn’t have to risk anything by saying “yes” that way. My life has changed drastically in the last four years. I won’t go into details of that here, but suffice it to say that I am learning to stop thinking so much about myself and my inadequacies, and to think more about what/whom I can be involved with. A recent opportunity came my way that I have been tweeting and Facebooking (that is a verb now, isn’t it?) about. 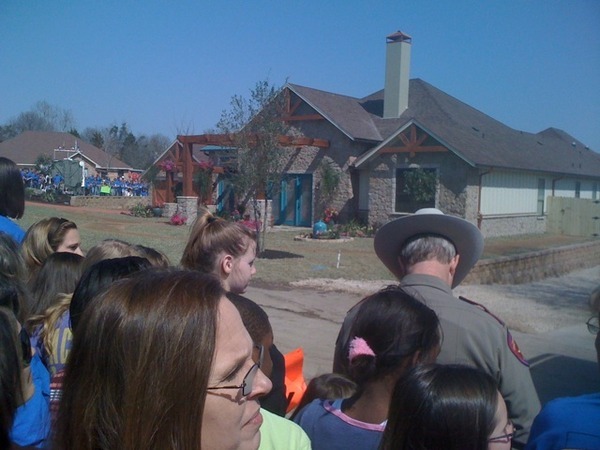 ABC’s Extreme Makeover: Home Edition came to my small town! There is a family in my town by the name of Carr. The couple have adopted four children, two of whom have had amputated limbs and other health problems. The father himself has battled cancer and has had organ transplants. Their home was small, leaky, moldy, and poorly wired. They needed more space for the children to move around safely. The Home Makeover team deemed them deserving, and headed to Mineola to bless them. Extreme Home Makeover builds are hugely dependent upon locals to do the work. The stars do come to the site, meet the family, do some planning and designing, and a bit of hands on work. However, 90% of the real work is done by the family’s community! (That’s a guesstimate, by the way.) Our local ABC affiliate, KLTV 7, would put out a call each night on the news to tell the viewers in the area what skilled laborers were needed at that moment; sometimes stucco professionals, sometimes stonemasons, sometimes painters, etc. The community would rally and people would show up to volunteer their time and talents for the cause. I loved it! I am not a skilled laborer. You guys know I pretty much bake and cook and read and write. So when it was my turn to volunteer, I was in the food tent! 🙂 I worked for my friend Carrie who owns Nutty’s Peanut Butter with her husband, Keith. 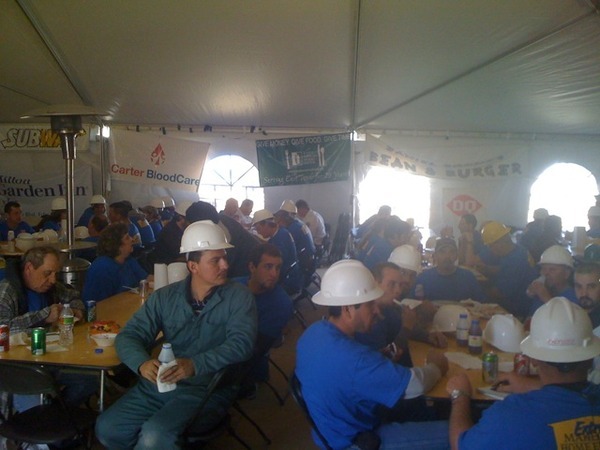 I spent a day feeding hungry construction workers, hole diggers, fence builders, and even some of the crew from California, peanut butter and jelly sandwiches! To do this I had to be friendly, outgoing, encouraging, and enthusiastic, which I chose to be. It was easy, in a place where there was such a spirit of unity and goodwill. I had my picture taken with some people, was flirted with by some goofy fence dudes (Katie, not a word!) and even was able to walk through the amazing home with my friend Korlyn. I didn’t work on the house, but I fueled the people up who did! 🙂 What a lovely experience. The point is that five years ago, I would not have been there. I’d have been here at home, watching it on t.v. I wouldn’t have dreamed of setting foot there, where so many strangers were gathering and where I was unsure of what might happen or who might be unkind to me or make me feel unwelcome. I was an observer only. I am thankful for the changes in my life that are allowing me to say “yes” more often. I want that “my very flesh should become a poem,” as Whitman said. I want to be glad of my life. God didn’t give it to me to spend it sitting on a couch, watching other people live it out. I’m focusing on really living my life from now until it’s over! Are you? Mama Stef, Youre Amazing! What first pushed you out of your safe zone? Hey George! Thanks for such a kind compliment. I have to say that getting my act together physically and spiritually went hand in hand for me in gaining the ability to just live, getting out of my own way, you know? Learning about God’s grace freed me, most of all. So eloquently written my friend. Thank you, Kyli. (hug) Love you, sweet friend. Hey girl … thanks for sharing your thoughts with us. Amen!! to enjoying living life to the fullest and making it a poem. You have SO much to offer this world … and I’m so glad you have decided to come out from the shadows and be present! Of course you have always been precious to me. Char, I am so thankful that you have been one of my biggest encouragers for twelve years now, through thick and thin! 🙂 Love you!! YOU HAVE ALWAYS BEEN BEAUTIFUL IN GOD’S EYES AND MINE AND TIMS! It is good to see you more involved. I love you, your earth MAMA! Mama Stephf, I’m so very proud of you! As someone who grew up being the do-gooder and peacemaker, I hear you! It’s so inspiring to read about your new outlook in life, and saying Yes more. What a great opportunity you had, and I’m so glad you were able to seize it. That’s quite an accomplishment! I love that show and I’m always in tears watching it because of the good work they do. I didn’t know that they actually put a call on the local tv network for volunteers. See, that part they don’t include in the show. Joy, thank you so much for taking the time to stop to read my post; I’m honored. 🙂 I appreciate your encouragement, and I hope we both get lots of opportunities to say yes to good things, regardless of what others’ opinions might be. Check that blog out that Kaye recommended in these comments, along the same lines; what a lovely blog, too! I’m proud of you…choosing to really live your life is the best way!!! When I read your entry, I thought about this that I read this morning…they go hand in hand!!! Hope you enjoy it!! Kaye, thank you for your kind words and encouragement! I really love that blog you pointed me to. Really lovely and I love that she is out to encourage people to seize joy and love life! Awesome! I’m proud of you!!! You’ve made the best choice…and it is obvious to those of us who know and love you. Your entry went hand in hand with this that I read this morning…thought you might enjoy it! Blessings my friend!! Hey, Barb!! It is going to air on May 9th at 7pm CST. It’s the season finale! 🙂 It was such a great experience. How are you? I miss our chats. Wow you and I are so much alike! I’m seriously in that place right now. Learning to step out of the shadows. I still do not prefer the spotlight at all, but I’m less afraid to step out to try new things and meet new people. Enjoyed reading your blog post. I had no idea that you haven’t always been a “joiner and do-er” because you always seem so composed and at ease.